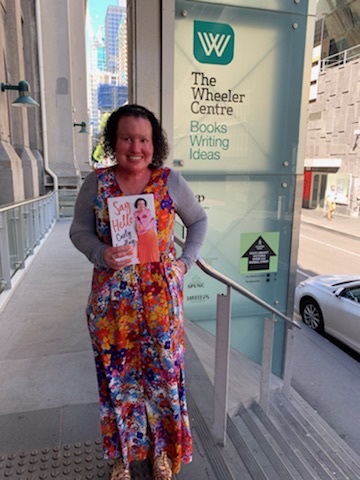 Say Hello Melbourne book launch – hurrah! On Thursday, 24 January, my first book, a memoir called Say Hello was launched! My book is in the world. It’s on shelves (as a paperback and ebook) on Tuesday 29 January. It will be in all good book stores, department stores and on ereaders. You can currently pre-order it from Booktopia and Apple Books. I pre-signed a heap of books beforehand – though I was lagging with the combination of just developing my author signature and the 43 degree heat. Still, I got through so many so quickly, and I think I’ve found my calling. Signing my name on things. The very lovely Kevin Mitchell – you might know him from Jebediah and Bob Evans – chatted to me about Say Hello and it was so much fun. He was smart and sensitive and really funny. You can watch the launch here. The event sold out. 200 people filled the room, despite the heat. It was trending on Twitter. I am so thankful. Thanks to Catherine Milne (pictured below), Nicola Robinson, Lara Wallace and Hazel Lam from HarperCollins, Jacinta Di Mase, Danielle Binks and Natasha Solomun from from Jacinta Di Mase Management, Writers Victoria, The Wheeler Centre, Readings, Kevin Mitchell, Lynn Gordon and Erin Gook from Auslan Stage Left, my parents, Adam and my friends for all of your support. And thank you to everyone – all 200 of you! – for coming out in the very hot weather to hear me speak and buy my book. I am so appreciative. It was fun having selfies with you, and I can’t wait to do it around the country. Danielle and I, in front of the huge pile of books. My parents and I. They’re the best. I wrote a book. I am proud, tired, happy and a little bit scared that it’s out there in the world. It was the hardest thing I’ve ever worked on. I wrote a book! You can find out everything about Say Hello, including tour dates, audiobook recording and international orders on the Say Hello page. I really hope you enjoy it. Pictures by Danielle Binks -apart from the one with her and I, which was taken by a Writers Victoria volunteer.